Can you pick out the show/ breeding quality patterns? The pet quality patterns? 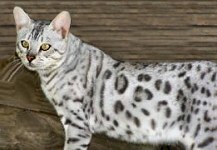 Pattern and color are of high importance to all Bengal lovers. Big bold spots, rosettes, stripes, horizontal alignment, contrast, clarity all come into play when evaluation kittens. Kittens on far right and left have more of a fuzzy looking baby coat. Part of this is the angle of the photo. above and left are same kittens, different lighting. 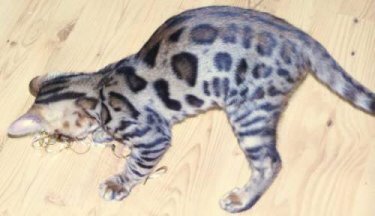 Pattern is icing on the cake when looking for a show / breeding Bengal. You must do a hands on evaluation for skeletal structure; spine, tail, legs, ribs. Turn the head to evaluate size and profile and ear size and placement. Holding and stretching the kitten will help evaluate length and depth of body, as well as pattern development. He will continue to develop his pattern for several more months. You have to know the parents to look ahead at how a kitten will develop. Trendar Eagle went into show / breeding program. Do not confuse a healthy fuzzy coat with the sick kitten who's coat looks greasy and messy. 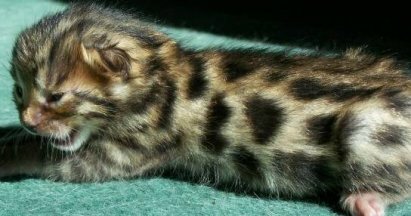 When kitten takes a step, the stretch of his pattern makes a blob or elongated bar turn into spots or rosetting. Unfortunately young kittens do not understand how to pose. The stretch may look uncomfortable, but it does not hurt, To see the future, you need to see how a blob of color will look as he gets larger, you must see the flow of his body pattern. Extreme type and horizontal flow. 1 week old Look at the pattern on this kitten. This is not desirable but there are many other things to consider. The shape of his spots indicate that they will develop into rosettes. The coat is short, clear color, conformation is good. A few months of changing and this circular pattern is not even considered in evaluating what this kitten has to offer. 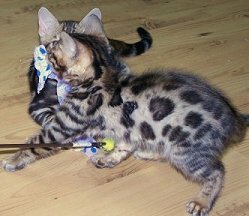 Clear coat, vivid contrast, thick tail, long head, small round ears..
Markings on the face and head, like stripes on a zebra, or fingerprints, are unique for each kitten. Bold contrasting lines going over the head are desirable to a Tabby M pattern. White Spectacles around the eyes, wide, white whisker pads and white on the cheeks between the mascara lines are traits that add to the wild expression. Left is an SBT Bengal, proper profile with mild dip between forehead and nose. Right is an F2 Female, lots of white on her face and puffy whisker pads. this face has not been achieved no most SBT Bengals. Both cats have rounded ears. Mood and expressions change face shape and ear set. You must have a critical eye to judge head shape.